Published: Jan. 20, 2019 at 04:35 p.m.
Los Angeles Rams running back Todd Gurley bursts through a hole and gets into the end zone for a 6-yard touchdown. Los Angeles Rams running back Todd Gurley rushes for a 35-yard touchdown. 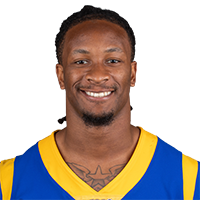 Published: Dec. 16, 2018 at 11:22 p.m.
Los Angeles Rams running back Todd Gurley makes it a one-possession game with touchdown run. Published: Dec. 16, 2018 at 09:18 p.m.
Los Angeles Rams running back Todd Gurley dodges and hurdles on powerful run.